Home › Government Failures › Big Government. Period. The government does not create anything. Only you do. The government only consumes or redistributes to others what you and I (the economy) create. They do not produce a product or provide a service for purchase in order to generate income. Government takes money away from you and gives it to someone else. It is a shell game of taking large sums of money from one group and giving it to another. This game of diversion is effective. It divides us by class, by race, by religion. If the power is to the people according to the Constitution, then a government that wanted to weaken that power would keep the people divided against each other. This allows the government to pander and make promises with some groups while taking away from others. All the while hiding its true purpose…the slow erosion of power from all groups over time. The tactic of dividing its citizenry and pitting them against each other based on class, race and religion is so commonly used by governments around the world and throughout history that it has a name…it’s called “government by division.” It is so common, it’s been coined as a phrase. Our government utilizes this tactic. Meanwhile, our society has become one of entitlement. 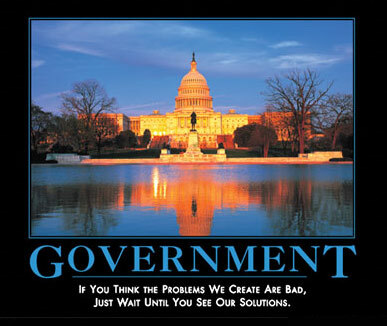 More and more people think that the government is here to solve all of their problems. I have read many articles about the “X Generation,” my generation…and the “Y Generation” having an increasing sense of entitlement. That somehow the government exists to make their lives easier and would support any increase in taxes (as long as it’s someone else’s taxes) that would secure some entitlement or right they feel is coming to them. I don’t know if that is true of these generations, but I am extremely afraid for the future of this Republic if it is. The government will gladly oblige them. The purpose of government, as designed by the Constitution, was extremely limited. Government originally was allowed to declare war, provide an army and navy, regulate interstate commerce, establish post offices and raise money to fund these things. Powers not assigned to the government in that list were given to the states and to the citizens of the United States. I know of no safe repository of the ultimate power of society but people. And if we think them not enlightened enough, the remedy is not to take the power from them, but to inform them by education. The writers of the constitution knew what government was…it was something to be feared. It is a necessary evil and one that must be chained down and caged by a separation of powers and rigid restrictions on what it can do. They wanted the true power to reside with the people. And therein lies the real problem. Power to the people is our greatest strength, and our greatest weakness. The power is with the people and the people have allowed government to break its chains one by one over the course of a hundred years by granting the government more and more powers with more and more control over our lives. All of this usurpation of our liberty, this transfer of power from the people to the government, all in the name of securing some entitlement or right that they feel the government should provide, rights that were never granted to it by the Constitution…and for a damn good reason. The loss of liberty in a Republic doesn’t happen in one generation, or two….not in one year, or a hundred…it happens slowly…quietly…with sinister stealth. One small freedom lost here, one small freedom lost there. The wall of liberty is chipped away one brick at a time by the chisel of tyranny. It happens so slowly, and so quietly that we don’t see it or hear it and what we do hear, we sweep aside as “just some small thing.” Each one, in itself, is not a great loss of freedom…but eventually as the holes in the wall start to connect and make much larger holes very quickly, we can see what we have truly sacrificed and by then it is too late. The government never creates, it only takes. It decides for its own political purposes what agenda it chooses to pursue and it rewards those who support its agenda and taxes and libels those who do not. If the government chooses socialism, which I believe it has, then those who support that dream will be rewarded. This includes labor unions, government workers, lobbyists, politicians from either side of the aisle who vote “the right way” and any non-profits/for-profits that assist the government in propagating its message, among others. I am not saying all individuals of these groups will support big government, but they are more likely too because they have something to gain by supporting big government policies. These supporters will vote for and sustain politicians that support these socialist programs and the government will reward them with tax money from your paycheck. The message will always be that government is the answer. That government can help you. That government has all the solutions. That you have been treated unfairly, discriminated against, cheated, robbed, abused or otherwise marginally maligned against by someone at sometime for something…and they understand, and they are here to help you. So many great people in history, so many that we know and respect, many that go back so far into history we can’t even relate to their daily lives…so many of them have had their words immortalized for all time and so many of their words have been warnings about the true nature of government. Can so many great, intellectual and important people be wrong? Their words are the sum of their life’s learning and of those who lived and spoke before them. The quotes in my post today are only a handful of hundreds like them. They all have the same warning about the nature of government. Their words have stood the test of time. Are we so egocentric to think that it can’t happen to us?